The Minnesota Corn Growers Association and Minnesota Corn Research & Promotion Council welcomed National Corn Growers Association (NCGA) President Kevin Skunes to its joint board meeting last week. 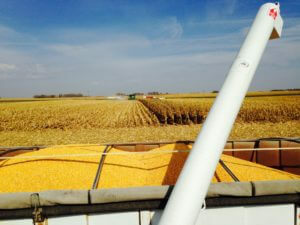 For Skunes, it was an opportunity to recap what was a tumultuous year for NCGA as it worked to overcome federal issues impacting the nation’s corn farmers. Skunes, who farms in Arthur, N.D., said when his one-year term started last October he envisioned the farm bill would occupy the majority of his efforts. Last week the Minnesota Corn Growers Association (MCGA) was in Washington D.C. with our fellow state corn organizations to participate in Corn Congress. Corn grower delegates and alternates from across the U.S. come together twice a year to debate and adopt new policy positions that make up the National Corn Growers Association policy book, which gives direction on federal policy positions. The 2017 Census of Agriculture will begin hitting farmers’ mailboxes this week, as the U.S. Department of Agriculture looks to update its information on land use and ownership, operator characteristics, production practices, income and expenditures. Conducted once every five years, the Census of Agriculture is sent to approximately 3 million U.S. producers, including nearly 100,000 growers in Minnesota. Farmers are being asked to fill out the census questionnaire online using instructions found on the mailed portion or return it completed by mail. The Environmental Protection Agency (EPA) finalized a rule today that establishes the required renewable fuel volumes under the Renewable Fuel Standard. Total renewable fuel volume as part of the 2018 Renewable Volume Obligations (RVO) is 19.29 billion gallons, which is relatively flat compared to 2017 volumes (19.28 billion gallons). As part of the Renewable Fuel Standard, the Environmental Protection Agency (EPA) released proposed 2018 Renewable Volume Obligations (RVO) yesterday, calling for maintaining the same level of conventional biofuels as 2017. 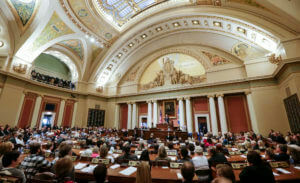 According to the Minnesota Management and Budget’s (MMB) February Forecast, which was issued on Tuesday, Feb. 28, the state is projected to have a slightly larger budget surplus than what was predicted back in November. As has been mentioned before, policymakers have been discussing a variety of ways to manage the budget surplus, now estimated at approximately $1.65 billion for the two-year budget cycle that begins July 1. Tax relief measures are among the more popular proposals of how to allocate the surplus. 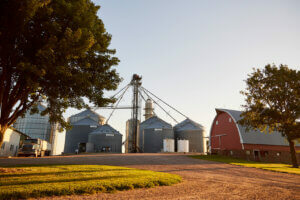 Significant farm and rural issues are receiving considerable attention at the State Capitol and earlier committee deadlines this year are contributing to a faster pace of bill introductions and committee discussions. 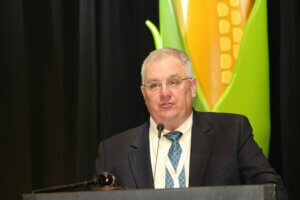 Here’s a quick update on some of the key issues of interest to corn farmers. On Friday, Feb. 3, at the Minnesota Environmental Congress, Gov. Dayton announced that he wanted a “25 by 25” plan concerning Minnesota’s water resources – a 25-percent improvement in water quality by the year 2025. A steady stream of customers pulled off the road from their afternoon commute on last Monday and drove up to the pumps at the Coborn’s/’Lil Dukes fueling station in Hastings to save money on ethanol-blended fuels. 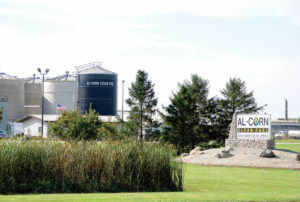 Clean air experts from American Lung Association of the Upper Midwest and Minnesota Corn Growers Association, answered motorists’ questions and asked them to fill out a survey to find out their attitudes about ethanol and where it fits in to their driving. Fall in Minnesota means the leaves changing color, farmers harvesting their fields, comfortable weather and kids going back to school. It also means the return of E15 fuel – a cleaner-burning blend of 15 percent homegrown ethanol and 85 percent gasoline approved for use in vehicles 2001 and newer. Ethanol fatigue is a real thing. Unfortunately, yes, we have to fight that battle all over again.